Are you a coffee drinker? I’m a big latte drinker. Years ago, I did a Make-vs.-Buy analysis, comparing the horrific amount I was spending at coffee shops on lattes to what it would cost me to buy a big foofy latte machine and make them myself. My wife approved, and that was more important than what my cost model indicated (at least that’s what she told me). Thankfully, both said the same thing – buy the latte machine, stupid! The one I bought is made in Italy, which makes me feel very European. Sometime back, I was at an airport getting ready for a flight. Since I couldn’t take my latte machine with me, I had to succumb to screwing up my cost model and buying a latte. I went to one of the famous coffee houses, the same chain whose stock price I single-handedly kept up for so many years. I ordered their smallest size drink, which has only one shot. Being nosey, I peered over the counter and watched them make it. For some reason, they were ok with that. My heart sank as I watched them pour 2 shots, with one going in my drink and the other one going….wait for it…wait for it…. 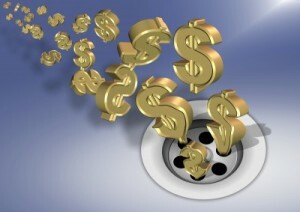 down the drain! She was cool as a cucumber about this whole thing, meanwhile, I was having heart palpitations and was more than willing to miss my international flight to get to the bottom of this. My client would understand, I rationalized. I was devastated. I have to say, this was one of the low points in my life. The other one was a medical procedure that everyone *promised* me I wouldn’t need until I was 50. We’re not going to talk about that. I’m trying to suppress that memory. Now just imagine how much energy this company spends on trying to reduce their costs with suppliers. Coffee, fixtures, latte machines, milk, cream, utilities, etc. I’m going to guess that their highest cost component is the coffee beans. Coffee plants produce very little crop, the processing costs are very high and labor and machine intensive, and shipping and importation costs are high too. In my case, the only type of coffee I buy is grown in South America and then later roasted in Italy, and then sent to the US! How much of the price I pay is going to shipping and import/export costs instead of to the physical product itself? Of course I justify it, because using Italian roasted beans make me feel very European. The purchasing professional that managed supplier selection for the latte machines may well have focused on acquisition cost instead of total cost. What is the cost of throwing away shots all day long? In all your stores? How much more would it have cost to buy latte machines that can make both an odd and even number of shots, and how much would be saved? While purchasing people shed blood, sweat, and tears trying to shave off a little more from supplier profit margin, there are huge supply chain savings opportunities just going down the drain all the time, sometimes quite literally. If I was CPO of this company, the first thing I would do is analyze all costs such as this. One of their employees once also told me that they also throw away all opened coffee bags at the end of every day (we’re talking unused coffee beans here), as well as all opened bottles of syrup, even if they are still full. I can’t say that’s true for sure, but if it is, all I can say is “wow”. I could also say “give them to me!! !” but even I’m not that nosey. My wife might be though. I’ll talk to her after this article. Are you focused on acquisition price or are you focused on total cost? Have you ever gotten a great acquisition price, but gotten a terrible total cost deal? Do you know what costs are unnecessary or being completely wasted with your suppliers? Have you checked? Successful companies can get complacent with how they do business. The same thing happens with purchasing professionals. It’s easy to assume you are successful because of everything you do, when in fact it’s very possible, and often times the case, that you are successful in *spite* of many of the things you are doing! Don’t assume you are the exception. I see very smart purchasing professionals miss opportunities all the time. Previous post: Is Urgency In Purchasing Negotiations Always Leaving You With The Short End Of The Stick?